Showing results for tags 'Clover'. 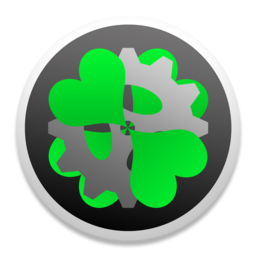 Clover Builder app v 1.2.1 Small tool to download, compile and build the latest Clover X64 package. The script inside is editable. What's New in Version v1.2.2 Copy to Mandatory drivers64UEFI: ApfsDriverLoader.efi, AptioMemoryFix.efi, AptioInputFix.efi. Copy to \EFI\CLOVER\tools\: CleanNvram.efi. VerifyMsrE2.efi. Make Clover_v2.4k_rNNNN.pkg without﻿ FakeSMC.kext. Make CloverISO-NNNN.tar.lzma with﻿ FakeSMC.kext. Corrected makeiso error. Для установки в mac os. Данный файл предназначен для установки clover в виде программы в mac os (hackintosh) . После установки устройство должно заходить в систему без флешки. longtime delays while starting clover. why? Changelog 2015-12-19: Added instructions for El Capitan along the guide and updated the attachments - now including Clover 3320. Reason: ASMedia 1042 is finally supported since El Capitan 10.11.2 and GenericUSBXHCI 1.2.11. For El Capitan stable releases, non-Apple kexts should preferably (in some cases, mandatorily) be copied to EFI/CLOVER/kexts/10.11, for which you'll need InjectKexts=true and disabled SIP. post-install.zip updated with kexts that work for El Capitan too. Included separate versions of Audio_NP530U3B, one for each OS: Audio_NP530U3B_Mav.zip and Audio_NP530U3B_ElCap.zip. USB 3.0 is working for installation. 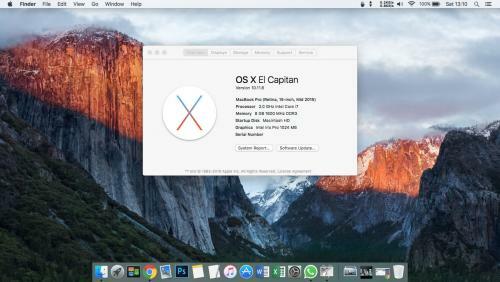 2015-08-23: Tested the same method for OS X El Capitan Public Beta. Basically all you need is to update everything (Clover and all the kexts) and the only really important modification is to use these as the Clover boot arguments: -v kext-dev-mode=1 -rootless=0 (thanks leocg). The system will already be usable with full backlight and graphics. Also, the current GenericUSBXHCI doesn't work with El Capitan and must not be loaded (no USB3, ASMedia 1042 unsupported so far). I'll probably adapt this guide or create a new one once I reach a good level of completeness with El Capitan. 2015-05-18: Added display color profile, fine-tuned for this laptop: Display Calibrated.icc.zip 2015-03-22: Modified config.plist with AppleIntelSNBGraphicsFB patches so that HDMI audio is working now (thanks toleda). Also modified config.plist so that now the _DSM method from HDEF device is included by Clover, no need for DSDT patch anymore. 2015-03-20: Added NVRAM and EmuVariableUefi considerations (thanks nguyen). Updated SSDT part with updated ssdtPRGen. 2015-03-18: Big update! apianti made me notice that the system was only able to boot with a specific Clover version because that version I had, had a special driver called HFSPlus, which is not part of the Clover installers. The VBoxHfs driver won't boot from external drives, only from internal drives. Knowing that, now we can use even the most recent Clover version and that definitely makes things easier, especially for booting newer OSX's. 2015-02-25: updated with EAPDFix v2.0.1, instructions for kext reload added to the guide. Updated all kexts from post-install.zip to the most recent versions. 2015-02-23: Some extra reviews, added an introduction and Clover Configurator suggestion. 2015-02-22: Some overall minor updates (new links, formatting, grammar...). 2015-01-13: Added Chatzki report about a possible mistake on the section that explains how to activate two-finger scrolling gesture. 2014-09-18: it's safe to update to 10.9.5, no pre- nor post-interventions needed. 2014-07-16: it's safe to update to 10.9.4, no pre- nor post-interventions needed. 2014-05-31: it's safe to update to 10.9.3, no pre- nor post-interventions needed. 2014-03-17: Removed NullCPUPowerManagement.kext from Clover_2236.zip - thanks nguyen! 2014-03-13: EDID injection section moved to a dedicated thread 2014-03-12: added boot time improvement tips 2014-03-05: TRIM enabler is now done on-the-fly by Clover. No extra app is needed anymore. The changes were in the config.plist both from Clover_2236.zip and post-install.zip 2014-02-27: it's safe to update to 10.9.2, no pre- nor post-interventions needed. 2014-02-21: added some clarifications after feedback on #16. 2014-02-17: updated BIOS section with pictures and discovered the reason why I lost access to it before. That means: you won't lose access to yours anymore 2014-02-15: reconsiderations about the hibernation. 2014-02-10: changed the whole SSDT part, new config.plist needed. I'm still studying about the optimal way to use the SSDTs but this is already giving a Geekbench 10% increase and so far no problems. Updated some kexts. Small change in audio patch. Removed EHCI and DTGP patches (DTGP now done by Clover). 2014-02-05: removed some useless DSDT patches (now only 4, all really needed). Fn key and LPC work without patches. 2014-01-31: added some hardware specifications to help on search and specs comparison 2014-01-30: corrected AppleHDA269.kext, now only 16KB and truly ready for system updates (the AppleHDA binary patch is done in Clover). Added Clover patch to enable VGA. 2014-01-29: added AppleIntelCPUPowerManagementInfo.kext output for reference (references.zip) 2014-01-28: three Windows steps could be removed thanks to a patch rewrite by RehabMan; internal microphone now working (thanks Mirone! ); 100% vanilla now: created an AppleHDA269.kext following Piker's New style of AppleHDA.kext patching Special acknowledgement: kyndder and RehabMan for their extensive support, patience, and for having taught me everything I know. So, what is cool about this guide? There are still many many tutorials around the web teaching you how to install a Hackintosh in a very old fashion: using distros (hacked versions of Mac OS), using Chameleon bootloader, Legacy booting, manually patching kernel extensions... Here I have put all my efforts on the newest methods available in order to have a very stable and clean system, without hard modifications to it. Let me give you an example: the first version I installed was 10.9 and I was able to gradually update to 10.9.5 without extra efforts (at all!). I just went into the App Store and clicked Update, just like a real Mac. When El Capitan came out, almost no modifications were needed to my setup, actually the hardest part was waiting for people to release some driver updates The Clover bootloader is the main facility here. Thanks to it, you can UEFI boot and configure some patches that are applied on-the-fly to the Mac settings, keeping all the OS files original (or vanilla as you'll often read), but simply read differently once the system is starting. Instead of hacking the OS, you hack the way the OS interprets your machine. That's why everything keeps working when you update the system. Finally, and maybe the most important, a completely bizarre particularity of this laptop was found and solved after weeks of research: you will need an EDID injection in order to activate the built-in display (ok that's kinda common, actually) and then you also need a DSDT edit to achieve full brightness, because there's a memory register set to a value that turns out to be very low on this specific display. The overall procedure here described is recommended even for different laptops or even desktops, however keep in mind that this guide can be used then only as a very superficial base - surely many modifications here recommended should not be done, and some extra will be needed, especially on the DSDT. The steps here described are strictly optimized for the Samsung Series 5 NP530U3B laptop. Working: Built-in display with brightness control, full backlight and resolution Intel HD Graphics 3000: QE/CI, full speed step (350MHz - 1.15GHz), HDMI (with audio) and mini-VGA outputs Intel Core i5-2467M: full speed step (800MHz - 2.3GHz) Realtek ALC269VC: built-in speakers and microphone, headphones Realtek RTL8168: Ethernet ASMedia 1042: USB 3.0 (for El Capitan, only since 10.11.2) Bluetooth Battery percentage Touchpad Keyboard commands with the key Fn Mavericks only: Card reader and Integrated camera iCloud, iMessage, FaceTime (last tested on March 22nd 2015) Sleep (from RAM only) Not working: Integrated WiFi. Intel Centrino will probably never be supported, please buy a compatible WiFi USB Adapter. 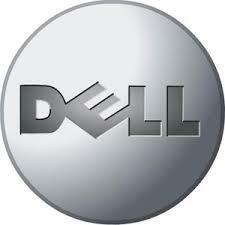 Hibernation, which implies that the PC will keep some power usage while sleeping. FYK, hibernation doesn't exist on real Macs so this is not simple to get. El Capitan only: Card reader and Integrated camera Unstable: Mavericks only: no audio after boot and/or after sleep. Needs to reload EAPDFix.kext El Capitan only: shutdown and sleep will instantly reboot the machine if certain USB devices are kept connected, such as my WiFi dongle. When I take it off before sleeping or shutting down, they both work fine. Both systems: the USB 3.0 port often doesn't work after sleep This guide will simply and only avoid you one special job: research. This is not meant to be and will never be a "next-next-finish" procedure, unless you want to have a crappy system, and I don't really expect that from an Apple user. You will be able to install it after some hours of work. It took me a month to study and test a lot of solutions until I had a usable system, and I keep studying to make it better One of the very important parts of a Hackintosh consists in modding the DSDT, a system file containing lots of information about your PC's components and how they should interact with the system. This file is unique for each machine and even the same machine could have a different DSDT during its lifetime (e.g. after a BIOS update or a hardware upgrade). That means you should never use someone else's DSDT. So, during this guide, you'll prepare your very own DSDT, starting from the origin of it. Think positively: the hard work will only occur on the first installation; for later ones, you'll take profit of almost everything! Last but not least: the majority of the steps follow a necessary order, thus it is really important not to overpass. Don't reboot the machine if the guide doesn't say so, for example. Even with all the steps having been severely tested for over 2 years on tens of different OSX builds, I don't take any responsibility for any problem that could occur in your machine. You should also not attempt this guide if you don't know how to boot a USB Live Linux or to remove your HDD and install it into another machine, just to mention some usual PC recovery activities one should be used to in case of failures. Let it begin! --------------------- On Windows: 1. Update your BIOS on Samsung's SW Update. Here, the installation froze some times, and at every freeze I restarted the PC and retook it, until it finished successfully. I'm using version 13XK; I don't recommend using older versions and there aren't any newer while I write this guide. 2. Download the attached Clover_3320_preinstall.zip and extract it to any-size pen drive just formatted as FAT32. If you prefer, you can download the Clover installer, replace VBoxHfs driver by HFSPlus driver, install drivers EmuVariableUefi and OsxAptioFix, replace the config.plist with the one included on this zip and include the needed kexts in order to be able to boot and have your keyboard/mouse/touchpad/USB 3.0 detected. However, the zip already includes all that. 3. Follow steps 1-3 of the EDID injection guide to dump your EDID in base64. 4. There's only one adjustment to be made in the attached Clover: open EFI/CLOVER/config.plist on notepad, search for "CustomEDID" and change the string to the EDID64 you got from the guide. If you don't do that, you'll get a black screen on your laptop after booting Mac OS X, as said. ------------------------------ On the BIOS setup: In the Advanced tab, change AHCI Mode Control to Manual, and Set AHCI Mode to Enabled. Notice that "Fast BIOS Mode" lies that if Disabled the system can boot Legacy OS only. It does boot UEFI OS when Disabled! Moreover, you won't be able to boot from a USB drive if this is set to Enabled, so leave it Disabled. If someday you want to enable Fast BIOS, you'll need to use Esc+F2 whenever you want to enter the BIOS again. In the Boot tab, change UEFI Boot Support to Enabled and enter Boot Device Priority to put your device containing Clover (USB HDD probably) to the 1st place. I had problems when booting from "select boot device", so it's better to set it here. ------------------- Installation: 1. Download OS X Mavericks/El Capitan on the App Store and install it to a USB device following OSXDaily's guide. The USB device should be preferentially formatted in a GUID partition table via Disk Utility and the install partition should be at least 7GB. You can install Clover to the EFI partition of this USB drive and even have multiple installations, as I have on my USB 3.0 external HDD (see the picture below). If you don't have a machine running Mac OS X, you may want to try a VirtualBox, and in that case you might want to exchange files between Windows and the virtual Mac, for which you may want to refer to paulscode post. 2. Plug the Clover and Installation USB drives to any USB port. If you have put your installation files to a USB 3.0 device, you'll likely speed up your installation by plugging it to the USB 3.0 port. Use a 2.0 port if you have any troubles. Once you've booted from the USB, Clover should show up. Press the F4 key; this is going to save a lot of original files from your machine, such as the famous DSDT, in the folder EFI/CLOVER/ACPI/origin. We'll use them later for some patching. Clover may seem to have frozen for some seconds; don't panic, it is just saving the files. 3. Enter "Boot from Install OS X Mavericks" (or El Capitan) and wait for the install to load, it should take up to 2 minutes to show the graphics (time will vary depending on the attached drive, especially if USB 2.0 or 3.0) and then around 30 seconds to ask you for a mouse/keyboard if you haven't connected a mouse to a USB port. If it freezes for longer than this in any message, there's something wrong. Please post it here if you're using the same laptop model, otherwise refer to Google or create your own topic in these forums saying where did your boot hang up. 4. Once the graphical installation is loaded, you'll surely notice the brightness is very low (maybe you'll even think your display is off!). I found out that there's a memory register which needs a specific value to activate full backlight, and RehabMan then built a DSDT patch that sets this register in conjunction with ACPIBacklight.kext. You'll install both the patch and the kext later, because these procedures require the Mac OS to be installed, so you'll just have to be patient and use the display like that for the first moments... 5. Open the installation's Disk Utility (top bar > Utilities > Disk Utility) and partition your HDD. In case you're intending to dual-boot later, leave some free space for the Windows partition(s) after the Mac partitions, otherwise it won't work. If you plan to use the Windows free space for multiple partitions, be aware that the installation can only be made in the first of them. If you want a partition with native read&write support on both Windows and OSX, use exFAT. NTFS is read-only on Mac and FAT will give you problems for files bigger than 4GB. You don't need to mess with the SSD. You can try to install Mac on it, but 16GB is just too small, you won't be able to install almost anything on your Mac then. If you want to make a slight upgrade and have an SSD dedicated to the Mac, go ahead and get a 32GB+. Another option is to create a Fusion Drive between the SSD and the HDD: this is the solution I've been using for over a year. People say this also tends to corrupt more... Well, my installation got corrupted after 1 year, but the overall speed boost I get everyday definitely made it worth it. Remember to Time Machine as often as you can! It certainly saved me days of work when I needed it. 6. Quit Disk Utility, follow the installation, restart and boot to your brand new Mac OS X to make the initial settings! ---------------------- On Mac OS X: Installing kexts: Drag and drop kexts over Kext Utility icon. If they're many, drop them all at once, otherwise at each kext installation the app will rebuild the kernel caches and this takes some time. To uninstall a kext, simply move it from the folder /System/Library/Extensions (also known as /S*/L*/E*) to a backup folder and run Kext Utility to update the caches. The kext is going to be loaded on the next boot. El Capitan: the next boot should be made with SIP disabled. Run kextstat on the terminal to certify that the kext is loaded, then run Kext Utility again to re-update the caches. In order to disable SIP, all you need is to set RtVariables/CsrActiveConfig and RtVariables/BooterConfig in the Clover's config.plist. Open the file, find the section RtVariables and make sure it looks like this: <key>RtVariables</key> <dict> <key>CsrActiveConfig</key> <string>0x67</string> <key>BooterConfig</key> <string>0x28</string> <key>ROM</key> <string></string> </dict> PS. : I've intentionally cleared the ROM string. You can generate one by using Clover Configurator. 1. Install the kexts included in the attached post_install.zip (RealtekRTL8111, ACPIBacklight, ACPIBatteryManager). These links serve not only for giving credits but also for verifying in the future if there exist any updated versions. 2. Reboot and check if your Ethernet (cable) network is working. 3. SSDT: read the readme, download and run ssdtPRGen.sh as normal user, not as root. You must be connected to the internet (the script downloads information about your CPU). Answer No to all the questions asked by the script. 4. Copy ~/Library/ssdtPRGen/SSDT.aml to EFI/CLOVER/ACPI/patched. Also copy EFI/CLOVER/ACPI/origin/SSDT-1.aml to the patched folder. Some methods in the DSDT make reference to a register defined in the original SSDT-1 so we need to keep it. These will be the only SSDTs to be loaded as Clover is set to drop all of the native ones (that's defined in the config.plist). Reminder: don't reboot yet! 5. DSDT: use MaciASL. Open the file DSDT.aml stored on the previously mentioned origin folder and apply the patches included on post-install.zip, compile and save as DSDT.aml on EFI/CLOVER/ACPI/patched. Apply the patches slowly, let the app take its time. It will only be possible to save the file if there are no compilation errors! Warnings and remarks are ok, some are going to show up, and they're going to be fixed via Clover patches. 6. Edit EFI/CLOVER/config.plist : look for the key "Generate", which is set to true, and change it to false. Now we're using a custom SSDT so we won't need Clover's auto-generation anymore. P.S. : we've manually applied some patches to the DSDT because it's unpracticable to apply them with Clover. The others are applied via Clover to reduce the amount of manual patches. This way, in case of a BIOS update or a hardware upgrade, you'll have to reapply just a very few patches to your new DSDT. 7. Reboot. Notice while booting the correct startup of AppleIntelCPUPowerManagement. Power management solved! And if you correctly applied the DSDT patches and installed the included ACPIBacklight, then you should also have full backlight. We're almost there! 8. 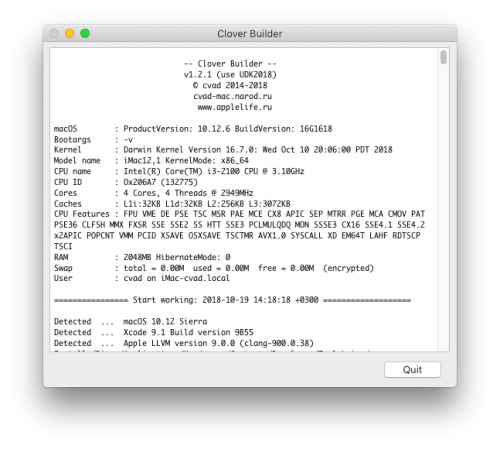 (Very recommended) Download and run the latest Clover installer and install it to your hard drive. This time we have some modifications in order to NVRAM work properly. Click on Change Install Location if your hard drive is not already selected. Continue > Customize. Check Install for UEFI Booting Only. This will automatically install Clover into the EFI partition. Drivers64UEFI: check OsxAptioFixDrv (only this one, and please don't use OsxAptioFixDrv-v2, it gives you artifacts on screen). Check "Install RC scripts on target volume" and "Install all RC scripts on all other bootable OSX volumes". Those are for NVRAM purposes. Once installed, replace VBoxHfs-64.efi by HFSPlus-64.efi to be able to boot from external drives I had a kernel panic at my first reboot, but since the second reboot everything works flawlessly. If you want more information about NVRAM and how to test if it's working properly, please refer to Everything you need to know about NVRAM (by nguyen). The fixes below have no specific order and they all require the system to be rebooted in order to start working. You're still welcome to apply them "at once" and reboot after all, but do it as you wish! Audio: install the kexts from the attached Audio_NP530U3B_Mav.zip (Mavericks) or Audio_NP530U3B_ElCap.zip (El Capitan). Mirone helped me to update the xmls, then I've put them to a new dummy kext (so that you don't need to remove original AppleHDA.kext) and edited EAPDFix.kext for this laptop's nodes. EAPDFix is for audio after sleep. If you ever suddenly have no audio (mostly happens after a cold boot), all you have to do is: sudo kextunload /System/Library/Extensions/EAPDFix.kext sudo kextload /System/Library/Extensions/EAPDFix.kext I have a script called EAPDReload.sh on my home folder, so I open up the terminal and run ./EAPDReload.sh. It has the same code as above, but the first line must be #!/bin/bash. I need it more often on Mavericks than on El Capitan. Battery: you've already patched and installed the kext, now you just need to go under System Preferences > Energy Saver and check "Show battery status in menu bar". Bluetooth: if you don't use it, remove the *Bluetooth* kexts from /S*/L*/E* in order to remove the support; however, this won't turn off the board. Scrolling gesture on the touchpad: System Preferences > Trackpad, move the tracking speed all the way up, test the scrolling, then reduce the speed back (thanks Andrea_ITA). Chatzki reported it worked for him after moving the scrolling speed all the way up. App Store & iCloud: do the steps described in the method #3 from this guide (remove all the Ethernet interfaces, then remove file /Library/Preferences/SystemConfiguration/NetworkInterfaces.plist and reboot). It's better to do this before having configured your network, but it's not mandatory. Also, if you haven't installed the RealtekRTL8111 kernel extension, then do it, otherwise you won't have an "en0" interface and Apple is going to say that your computer could not be verified. If Spotlight is heavily using the CPU and you are dual booting with Windows, prevent NTFS drives indexing. Hibernate: this is a known problem for PCs booting in UEFI mode. A temporary fix (currently works only for Mavericks) is to change the hibernation mode to 0 - this way, the sleep image will be stored in the RAM instead of in the disk, so the PC will keep draining the battery (low power of course) to provide energy to the RAM memory. It's different from the hibernation that we're used to in a Windows system, because it doesn't even exist on a real Mac. By the way, a real Mac has three hibernate modes: 0, 1 and 3. Many people succeeded on making a Hackintosh hibernate by using bizarre values like 21, 25, 29, 57... But I wasn't successful the time I tried it. Run the following command to set mode 0: sudo pmset -a hibernatemode 0 For El Capitan only, we will also execute two more commands: sudo pmset -a standby 0 && sudo pmset -a autopoweroff 0 In case you haven't done it and your laptop has hibernated, you'll notice on the next boot that the Mac OS X boot option in Clover now has "(Hibernate)" beside it. If you try to boot that, you'll get a reboot, that's why we change the mode to 0. If that happened to you, hit the spacebar over the "(Hibernate)" boot option on Clover and enter "Cancel hibernate". Once booted, execute the step above and also the command below: sudo rm /var/vm/sleepimage If you don't want sleepimage to ever be saved again (because it takes some Gigabytes), you can do this trick to create a 1 Byte unmodifiable file (thanks kyndder): cd /var/vm sudo rm sleepimage sudo touch sleepimage sudo chflags uchg sleepimage As mentioned in the working/not working/unstable (beginning of this guide), sleep can end up rebooting your machine depending on what is connected to the USB ports. It might be useful to know that you can prevent the system from sleeping when you're away from it using the caffeinate command, either alone for infinite waiting or followed by -t and the amount of seconds it should be kept running: caffeinate -t 3600 The common issues below are already solved for you if you're using my files: USB 3.0 on chipset ASMedia 1042: it works perfectly on El Capitan only since version 1.2.11 of GenericUSBXHCI, included on Clover_3320_preinstall.zip among the injected kexts. Curiously, Apple has reverted a change on the USB drivers on El Capitan 10.11.2 that made this possible. On earlier versions of ElCap, ASMedia 1042 is not supported. [AGPM controller] unknown platform: the MacBookPro8,1 SMBIOS requires your GPU to be named IGPU. On this laptop, it's called GFX0 instead. The Clover config.plist included in Clover_3320_preinstall.zip makes a DSDT patch that takes care of the renaming. The Mac OS X setup is over! Now run NovaBench (App Store), OpenGL Extensions Viewer (App Store) and GeekBench (free version on their website) and compare them with my results for the stock NP530U3B-A02FR: GeekBench, NovaBench, OpenGL (my current results are actually higher as I added a 4GB 1600MHz memory module). If you feel you're having problems with your installation, you can also compare the snippets of interest on your DSDT and SSDT to mine. The AppleIntelCPUPowerManagementInfo.kext output is interesting too. These are all included (DSDT, SSDT and AICPUPM output) in the attached references.zip. ------------------------------ Going further I really really recommend you to keep your Clover updated and to install Clover Configurator to take the most out of it. There will be plenty of options in there so you won't need to know each of the config.plist keys, everything is in the Configurator interface. Open your config.plist with the Clover Configurator and use the magic wand to get automatically filled the parameters in the SMBIOS section. For the SMBIOS/SmUUID, open the Mac terminal and run: uuidgen This will generate a random UUID, just copy-paste it to Clover Configurator. Besides the SmUUID, I've also cleared the RtVariables/ROM, RtVariables/MLB, SMBIOS/Board-ID and SMBIOS/Serial Number. All of these can be generated by Clover Configurator and I recommend to do it as chances of getting a working App Store, iMessage and FaceTime are bigger. ------------------------------ Installing Windows 8 Recommended read: Beginners guide to UEFI Dual boot OS X and Windows Format the SSD as FAT32 (MS_DOS option on Disk Utility) otherwise you'll get errors during Windows installation (apparently it tries to place some files to the SSD). If for some reason you can't format your SSD, unplugging it will also work. Format a USB drive for Windows 8 from a Windows computer (on Mac you'll get an error about duplicated privacy.rtf while you copy the .iso files) Extract the Windows 8 ISO to the USB drive. In case you've created a partition for Windows instead of leaving free space, erase that partition using the Windows installer, then select the new free space and click Next. Windows will automatically create the needed partitions on that space. To recover Clover, boot Windows and connect your pen drive containing Clover. Hold Shift key while you click on Restart to enter "Advanced startup" menu. Choose to boot from USB-HDD. Sync time between Windows and Mac: change Windows registry key. ------------------------------------------- Installing Clover to the HDD If everything seems to be running fine, you can start making some customizations to your Clover config.plist, such as removing "-v" from the Arguments key - this will show a gray Apple screen during the boot instead of a black console. The console is useful for debugging but if everything's fine then you don't really need it anymore. Also, personally I don't have other systems installed, I have Windows and Linux installed as virtual machines inside the Mac. So, it's pointless to select the system I want to boot. That's why I activated the "Text only" option in the GUI section and set Timeout to 0. As a final tune, you can now enable Fast BIOS option. Your Mac will boot in under than 10 seconds from the moment you click the Power button. Finally, you probably don't want to use forever a USB drive only for booting. You can install Clover directly to the hard drive, instead. Please follow step #9 and then the following steps: If you want to use your SSD with Mac, format it as Mac OS Extended and mount its EFI partition using Disk Utility. EFI partitions are hidden, you'll need to follow this tutorial to see them. Copy the EFI folder from the USB drive to the SSD EFI partition. You can also use the HDD's EFI partition. Mount the HDD EFI partition and copy the folder EFI/Microsoft to the just created EFI folder on the SSD. When you reboot using the Clover USB, go to Clover Boot Options and enter Add Clover boot options for all entries - this way, your BIOS will be able to boot from whichever drive you installed Clover, including your SSD (normally the BIOS doesn't have an option to boot from the SSD). Reboot now without the Clover USB and it should work! ------------------------------------------- Final words It took me a lot of time to write this guide, but I felt I needed to do it after so many people hard working to help me and the whole community. If you have something to add, please do it! You're also welcome to make any critics and further suggestions to this guide. If you wish to use it as a base for writing your own guide, I just ask you to link to my topic. Good hacking! So my hackintosh rig that ran almost perfectly on Sierra, with an i3 2120, was upgraded with an i7 2600k. Since then, it has been extremely unstable. A lot of times it wont boot, it will either KP out, or just shut down. Clover tends to freeze when I select 'boot verbose' so I can see whats going on. When it does boot, sometimes it works fine, but then within a couple of days it will start freaking out...email wont open due to a network issue, it wont load pages saying the dns is incomplete or whatever message. It did this after I overclocked to 4.4GHz, so I figured it was not liking the OC. okay, so I set it back to stock and it ran ok for a little while, then started doing the same things. I have nullcpupowermanagement.kext installed in the clover kexts folder for 10.12, but it loads intel anyway, and throttling does work... SMC sensors. This morning I started to do some homework, and it started not connecting and lagging bad. So I rebooted it, and it wont boot. I pulled the power plug out and held the power button for 30 seconds, just in case. Still wont boot. Tried multiple times, and wont boot. It keeps shutting down when it gets to the last part before the graphics load. So I think I have it narrowed down to the graphics.... but what I don't get is why its doing this all of a sudden. specs Asus P8Z68V-LE motherboard Intel i7 2600k 3.5GHz (don't have it overclocked unless I'm gaming in Windows) 24GB DDR3 memory Mac OS Sierra 12.12.3 ( I believe, cant boot it to check, it could possibly be .4) on a Samsung 120GB SSD CLOVER bootloader Windows 10 Professional on a 120GB Kingston SSD Geforce GTX 570 1GB even overclocked, after running Prime 95 all night, the highest temperature it hit was 67c, so at stock speeds I know that it is not overheating or anything. Thinking it needs a reinstall of Sierra, as the OS was a reimage from a test hard drive I installed and configured it on. Thoughts? Your graphics framebuffer kext is correctly loaded, but you receive no image after boot messages (aka black screen); Your display seem to work fine only randomly; You have blinking screen or many artifacts. EDID injection is a likely solution for all of these! The Clover bootloader makes it very easy to be done 1. On Windows, download and run RW-Everything (this one has multiple interesting utilities but you can use any other, like EDID Viewer, Phoenix EDID Designer, and possibly others...) Note: Linux is also capable of dumping EDIDs, but for my laptop's built-in display, it was only possible through Windows. If you want to try it from Linux, I recommend this guide here. 2. Assuming you're using RW-Everything, click on EDID button. You'll see something like this: (don't copy, it won't work for you, EDIDs differ for each display and this is mine) 00 01 02 03 04 05 06 07 08 09 0A 0B 0C 0D 0E 0F00 00 FF FF FF FF FF FF 00 4C A3 00 02 FF FF FF FF10 00 15 01 03 80 1D 10 FF 2F 00 00 A0 57 49 9B 2620 10 48 4F 00 00 00 01 01 01 01 01 01 01 01 01 0130 01 01 01 01 01 01 9E 1B 56 78 50 00 18 30 30 2040 25 00 25 A5 10 00 00 19 00 00 00 FD 00 00 3C 0050 D9 08 00 00 00 00 00 00 00 00 00 00 00 00 00 0060 00 00 00 00 00 00 00 00 00 00 00 00 00 00 00 0070 00 00 00 00 00 00 00 00 00 00 00 00 00 00 00 CC 3. Copy and paste it on notepad. Erase the first line and the first column, they are just references, not part of the EDID. You will have something like this: 00 FF FF FF FF FF FF 00 4C A3 00 02 FF FF FF FF00 15 01 03 80 1D 10 FF 2F 00 00 A0 57 49 9B 2610 48 4F 00 00 00 01 01 01 01 01 01 01 01 01 0101 01 01 01 01 01 9E 1B 56 78 50 00 18 30 30 2025 00 25 A5 10 00 00 19 00 00 00 FD 00 00 3C 00D9 08 00 00 00 00 00 00 00 00 00 00 00 00 00 0000 00 00 00 00 00 00 00 00 00 00 00 00 00 00 0000 00 00 00 00 00 00 00 00 00 00 00 00 00 00 CC 4.?Remove every line break and spaces, ending up with a single line of hexadecimal code, then use HEX -> Base64 to convert it to base 64. Save the result as EDID64.txt on a pen drive. This is my base 64 EDID, the general format of yours will resemble it: AP///////wBMowAC/////wAVAQOAHRD/LwAAoFdJmyYQSE8AAAABAQEBAQEBAQEBAQEBAQEBnhtWeFAAGDAwICUAJaUQAAAZAAAA/QAAPADZCAAAAAAAAAAAAAAAAAAAAAAAAAAAAAAAAAAAAAAAAAAAAAAAAAAAAAAAAAAAAMw= 5. Final steps: just add it to your Clover config.plist like the example below: (more information here if needed) <key>Graphics</key><dict> <key>InjectEDID</key> <true/> <key>CustomEDID</key> <data>AP///////wBMowAC/////wAVAQOAHRD/LwAAoFdJmyYQSE8AAAABAQEBAQEBAQEBAQEBAQEBnhtWeFAAGDAwICUAJaUQAAAZAAAA/QAAPADZCAAAAAAAAAAAAAAAAAAAAAAAAAAAAAAAAAAAAAAAAAAAAAAAAAAAAAAAAAAAAMw=</data></dict> Don't duplicate the Graphics key in your config.plist - be careful to simply add the keys InjectEDID and CustomEDID inside the Graphics key if you already have it. My guide in my signature contains my config.plist attached, you can check it if you're still not feeling sure. Any further doubts, please post here! Thanks to kyndder for originally explaining the process in the Clover bootloader thread. Inject EDID set by default!! Gigabyte Z68X-UD3H-B3 tool pack is all-in-one post-installation pack designed specifically for this motherboard. Fully patched set of DSDT files is included, additional drivers, definitions + several useful applications... The DSDT for Legacy Award F12 BIOS is still in the pack, however for perfect hackintosh consider to switch on UEFI BIOS & CLOVER boot loader. Other Post Installation Tool Packs Don't forget to check this page for future updates! I have just installed OS X Yosemite on my PC and it all appears to be going fine (even iMessage and FaceTime work) however I cannot get it to see any USB devices except USB KB/M, and if I connect a KB or M after boot they do not work, I have tried using USBBusFix=1 and 0, neither seem to work. I have tried using Flash Drives, External HDDs, External DVD drives and even a USB Floppy Disk Drive (All of which work fine on my 2007 MacBook. Does anyone have any suggestions?